Every weekend we dig into the archives. This by post Matt was originally published in March 2015. The last census was two years ago and there’s already been a lot of analysis of the results of it. 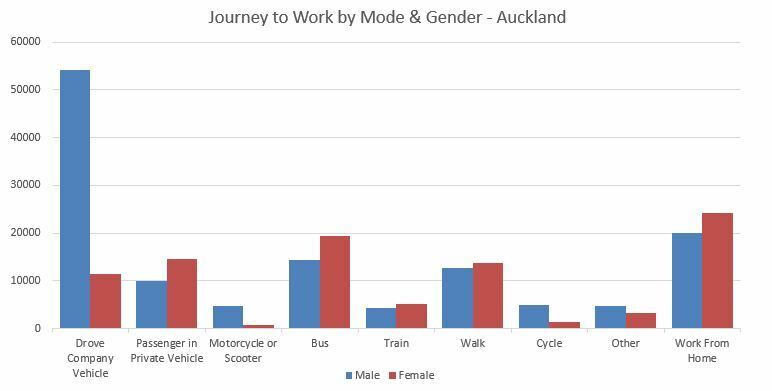 In terms of transport the census asks about Journeys to Work and while it is a fairly flawed metric due to it ignoring other trip generators like journeys to education – a large component of the morning peak in particular – it still has shown some interesting results. 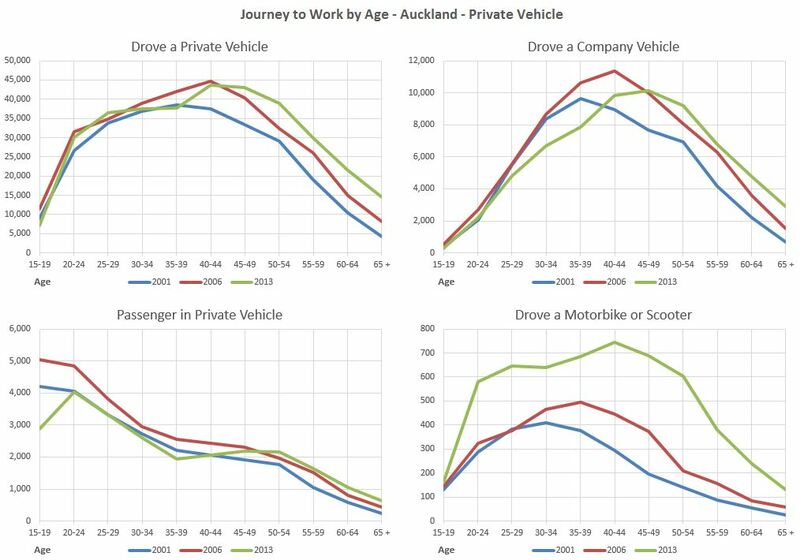 From it we know that in Auckland the number of people commuting to work by car increased, however it has partially come from fewer people carpooling and even more importantly it was eclipsed by the number commuting by PT. 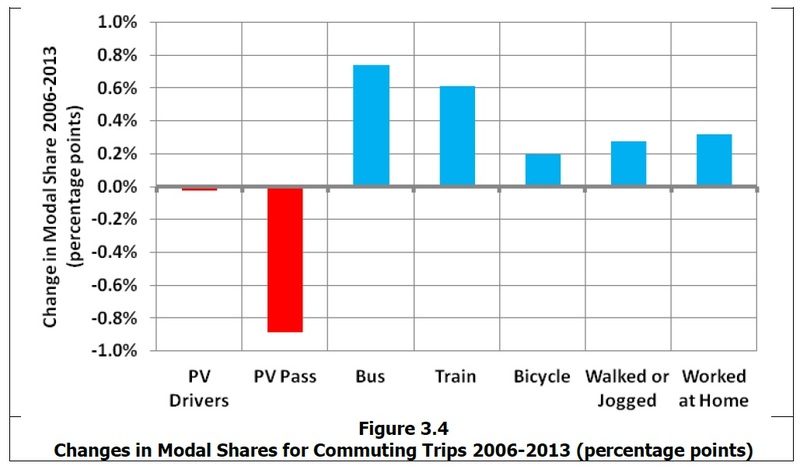 Add in the strong growth in people using active modes and there’s been the below shifts in modeshare. I just happened to be looking at Stats NZ a few days ago and came across data giving a demographic break down of the results which is something I haven’t seen before and the results are fascinating. In particular the results that caught my attention the most were those by age and gender and how that had changed over time. First up the total number of people who said they worked on Census day and you can clearly see from this the aging of the baby boomer generation. 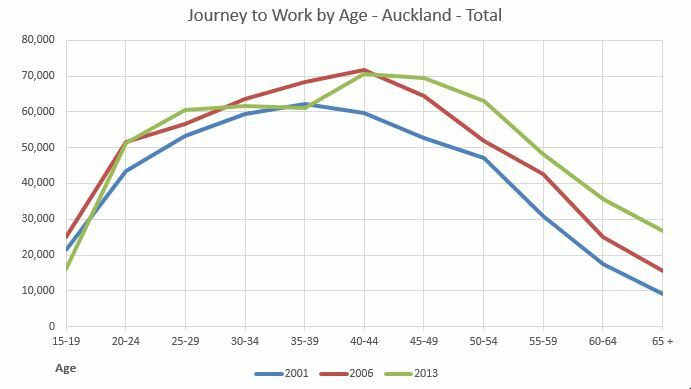 Unsurprisingly the number of people driving a private vehicle to work looks fairly similar to the graph above. What is interesting are the other private vehicle categories of driving a company vehicle, driving a motorbike or scooter and being a passenger in a car. Moving on to public transport I’ve only shown bus and train below because ferries are included in the Other category. What’s remarkable about the changes is that it so clearly shows that the growth in PT is being driven by the younger generations. The question is what the people in these younger age groups will do once they start getting older and having families etc. The changes in the older age groups suggest that the numbers using PT won’t drop off as much as they have in the past which will have big implications for mode share in the future. 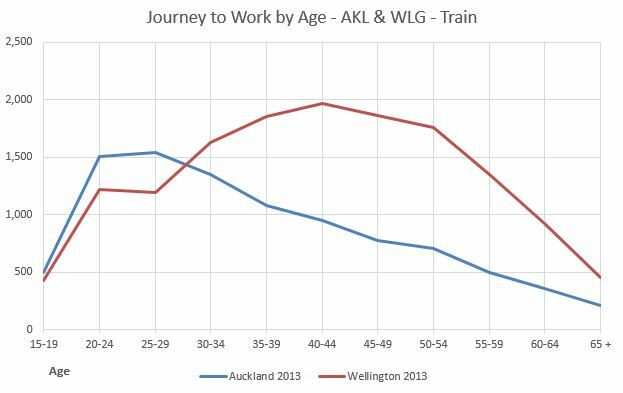 I’ve also looked at the data for Wellington and while most categories have a fairly similar profile to Auckland, the one that stands out as being dramatically different is in train use. I suspect that as Auckland’s network matures it will start to look more like Wellington’s does now. Next up are the active modes of walking and cycling with two very different trends. For walking its young people driving the change whereas for cycling it’s older generations making the shift. Lastly it’s the Other – which is likely to primarily be ferries – and those who worked from home. The latter is primarily made up of people who live in rural areas and the wealthier coastal areas places within the urban area. Overall there are some very interesting changes happening with how we travel and those are primarily occurring in non-car modes. If the younger generations continue to keep the current trends up then it’s likely to have big implications for how people get around in the future. The question is whether what we’re building is going to support that change or hinder it. The other piece of demographic information available is mode usage based on gender. Unlike age the gender split over each mode doesn’t seem to be changing much over time but what the data does highlight is that there is quite a lot of variance between the two based on which mode is looked at. Overall 54% of those who said they were working are men versus 46% women. In the graph below are the total numbers of each gender for each mode – with the exception of Driving a Private Car as it’s so large it makes it difficult to see the other results. The first thing you notice is how over represented men are in driving a company vehicle. This is also the case for riding motorbike or cycling. 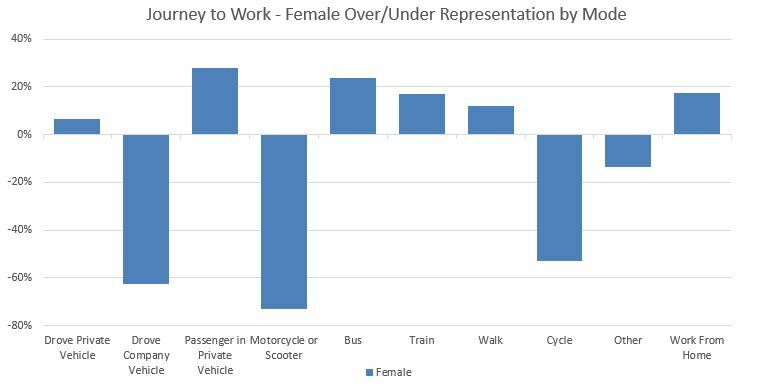 In the other modes more women than men are likely to be a car passenger, use PT, walk or work from home. To highlight the degree of over or under representation the graph below shows this for females (the opposite can obviously bee seen for males). Of these the quickest and easiest I think that we could change would be cycling and to do that it is essential we make our roads safer through far greater use of cycle infrastructure. If anyone wants to look into this deeper this info is also available by local board level which I’m sure would show some interesting results between different parts of Auckland. I am one of those who regularly use buses to travel to and from work each day. I am lucky enough to travel on a route that has frequency currently nominated to be at about 10-12 minute intervals at peak. There unfortunately are a handful of occasions where that frequency between 7:30 and 8:00am can drop to thirty minutes and as a consequence for those queuing it can become more as buses by pass later stops because they are full. On the return journey, at times there are two buses scheduled at the same time to depart to Long Bay (albeit by different routes), and a Castor Bay bus (that travels the same route) within two minutes of these two. I get that mistakes are made and I know morning delays occur because AT has not addressed congestion in suburban areas, but an acknowledgement would be nice. Compare this with Air NZ where the ceo has today front footed the issues that they have with an email message to stakeholders. I guess that is why we regard one as our national airline and the other as a bus and train operator. I think the change could be bigger than anyone is expecting from this. For quite a while, some poorer youngsters haven’t had access to cars to learn to drive in, and schools are trying to fill the gap to increase their opportunities. But getting enough practice is hard, through the multiple stages of getting the full license. Now I’m seeing other youngsters in a similar situation – if their parents have eschewed driving, even if they’ve got a car at home, it’s hard to do the “you drive to get some practice in” swap. Even after they’ve got a full license, they’re not doing enough practice to feel confident on our aggressively driven roads. I think Patrick’s “mullet city” idea might apply to this too – we’ll be a city of two ‘hairstyles’ when it comes to driving culture, too. Those who’ve jumped in to the car dependency culture, and those for whom it’ll never quite feel comfortable. Not sure what the class implications of a ‘mullet city’ are here… Can someone elaborate on this? Huge. We need to make sure we get a better outcome than this. Unfortunately, it is a realistic outcome if the city can’t crack some of the hard issues. “For walking its young people driving the change whereas for cycling it’s older generations making the shift.” Thanks for highlighting this, Matt. It’s opposite to what I would have thought. The cycling thing is interesting. That said, while there has been a drop since 2001, the relative increase from 15-19 to 30-34 between cycling and walking seems similar in 2013. I presume the increase for these ages ranges is at in part because of the increase in the number of people who have jobs and I guess also fewer being dropped off by mum or dad. I too wouldn’t have expected cycling to continue to increase after 30-34 although it’s not that much.